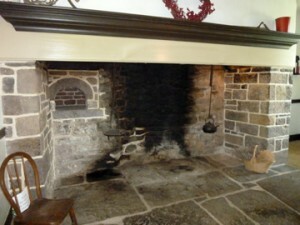 A fireplace in which the pots and kettles hung from a lug-pole. There is no cooking crane. Anyone who has ever visited a historic home or living history village has probably seen a fireplace fitted out with a cooking crane, perhaps with pots hanging from hooks or a trammel, but long before there were cooking cranes there was the humble lug-pole. The lug-pole was a freshly-cut pole of green wood, sometimes called a back-bar, suspended between two ledges high up in the chimney from which hung chains, pots, kettles, and other utensils needed for meal preparation. A lug is a handle or projection used as a hold or support. The chimney-side was called a lug prior to the 18th century, thus the pole that was suspended from side to side high in the chimney was a lug-pole. The English sometimes called them a gallow-balke, and the hooks that hung from the pole a gallow-crooke. These terms are also found on early estate inventories in New England. The estate inventory of Sir Timothie Hutton, Knt., a prosperous English fellow, dated 1624, listed among other items 4 ½ dozen pewter, 7 brass pots and posnets, 4 brass pans, 2 kettles, one pestle and mortar, 2 dripping pans, 2 frying pans, 3 spits, one pair of racks, a gallow balke, 3 pairs of gallow crookes, 3 pairs of pot crooks, a pair of tongs, a porringer, 3 ladles, one grater, and two chopping knives. – Hutton, Matthew. The Correspondence of Dr. Matthew Hutton, Archbishop of York. 1843. London. The lug-poles eventually dried out from the rising heat and become brittle or charred, especially when the cook was careless with the fire and allowed flames to burn too briskly. A wise man checked the condition of the lug pole periodically and replaced it before it was damaged and weakened enough to break, spilling his dinner in the ashes. Burns were common, and many fatal, when the lug-pole suddenly gave way spilling the contents of the kettles and boilers and splashing on whoever happened to be nearby. – Earle, Alice Morse. Colonial Dames and Good Wives. 1895. Cambridge, Mass. The lug-pole cost only some labor to install or to replace when it gave way. Because it did not swing in and out of the fireplace like a crane, the cook was required to lean in to stir pots and check for doneness as the food cooked. This was hot, smoky, and dirty work. Once the technology was in place, women were happy to replace the lug-pole with a cooking crane that swung in and out when their circumstances allowed. In early America, crude chimneys were made from sticks or blocks of wood laid similar to the logs in a log house with generous daubing of mud between them. The lower part of the chimney was coated in a thick layer of mud inside to a height above the devouring flames, and the lug-pole was usually suspended at about that height. It wasn’t uncommon for a cabin to burn down because the chimney itself made from such combustible materials caught fire. Fortunate was the woman whose chimney was brick or rock at the bottom and topped with sticks and mud. The chimney is  large with an oven in each end of him. He is so large that we can place our cyttle [kettle] within the clavel [mantle] piece. We can bake and brew and boil our cyttle all at one time in him. – John Winter, 1634, letter to friends still in Old England, quoted in Barrows, Anna. Everyday Housekeeping: a Magazine for Practical Housekeepers. Vol. 17-18. The massive fireplaces of that era burned logs so long they were sometimes hauled into the houses by horses and many kept sleds for that purpose. There was a seemingly never-ending supply of wood so it wouldn’t be for some years that the size of the fireplaces would need to be reduced drastically in an effort to reduce the amount of fuel needed for them. – Cornell Science Leaflet. Vol. 1-3. 1907. Perhaps my view is somewhat skewed, but I still find the hearth and its tools quaint and calming despite the amount of work that goes into preparing a meal. A motley collection of pot-hooks and hakes, of gib-crokes, twi-crokes, and trammels were hung upon the lug-pole, and in turn suspended from these, at various heights from the fire, were pots and kettles and other utensils. In the hearth corners were arrayed skillets and trivets, peels and slices, the dutch oven, etc., and above on the clavel piece were festooned strings of dried apples, pumpkins, corn, and peppers. – Ibid. No wonder early cooking vessels had extra long handles to allow the cook as much room between her and the danger of boiling water and hot food that might rain down without notice should the lug-pole burn through. Eventually some were able to replace the wooden lug-pole with an iron pole for safety but that still did not afford the cook the luxury of swinging the food out away from the heat and smoke to be stirred and otherwise tended. The next phase in the evolutionary process, the cooking crane, however, would soon do just that. Bib: Hazeltine, Gilbert Wilkinson. The Early History of the Town of Ellicott, Chautauqua County, N.Y. 1887. Jamestown, NY. Academy & Literature. Feb. 11, 1899. There was a time when the kitchen was so much at the heart of family life that it invariably was included in memoirs and reminiscences through the 19th century. It is regretable that for many Americans the kitchen is now the least used room in the home. Gideon Hollister wrote about the early homes of Connecticut in 1857. Of the kitchens, he said, “their table furniture was plain. Pewter was the more ordinary metal in use, but silver was often seen glittering upon the same table with the baser metal. Silver tankards and beakers were to be found in the houses of nearly all the wealthy planters of good family”. Julia Ward Howe remembered tables of her youth set with three-pronged steel forks for everyday use, and silver forks reserved for dinner parties. The pewter vessels Hollister found in estate inventories included spoons, platters, pitchers, cups, plates, pans, bottles, etc. There were silver flagons, beakers, tankards, spoons and cups. He made little mention of tin and crockery. Though sparse by today’s standards, the accounts are quite lavish compared to pioneers who moved to the frontier, often arriving with little more than a frying pan and pot. “A spider skillet with lid and an earthen pot were more than the average cooking utensils possessed by a family”. – Esary. The kitchen was my favorite room. It was lighted by four windows, its floor was scoured white and sanded with beach sand in summer, and carpeted with home-made rugs in winter. It served as a dining-room both winter and summer, the cooking being done in the summer in a little basement room made for that purpose. At that time there were no stoves, nor ranges, neither gas nor coal, and the cooking was done in the open fireplace by means of cranes inserted into the chimney, from which there suspended hooks for pots and kettles. There were ‘bake-kettles’ for the baking of biscuit and gingerbread over beds of live coals, which also were heaped on the cover. There were ‘tin-kitchens’ for the roasting of meats and poultry before the fire,–potatoes were baked in the hot ashes,–steaks were broiled over hot coals, and tea and coffee steeped on the hearth. The ashes were carefully raked over the bed of coals on the hearth at night to preserve the fire. If we ‘lost fire’, we fell back on the tinder-box, and struck a steel ring with a flint till a spark fell on tinder when it was blown into a flame. Or, if the tinder-box was out of order, we went to a neighbor’s kitchen and begged a shovelful of coals. The kitchen conveniences of those days would drive to despair our housekeepers of today. The associations of the always clean and orderly kitchen of my home were very pleasant to me and are so to-day. My chief delight in the spacious room was the freedom I found there. We could play, shout, run, jump, stand on the substantial chairs to look out the windows, play housekeeping, and set out the kitchen table with our little pewter dishes and tiny porringers, bring in our individual chairs, stools, and crickets (low stool) and build up establishments in every corner of the room, and then inaugurate a series of calls and visits to one another, take our rag-babies to ride in an overturned chair, which we dragged over the floor, sing to no tune ever written, or ever dreamed of, till my patient mother would beg a respite from the ear-splitting discord, that ‘we might rest our throats’, cut out dresses for our hideous rag dolls, botch them into shapelessness, and then coax the dear mother to make them ‘look like something’, which she did, hold prayer-meetings, preach sermons, tell stories of our own invention,–what was there that we were not at liberty to undertake in that kitchen, if we would not quarrel or get into mischief. 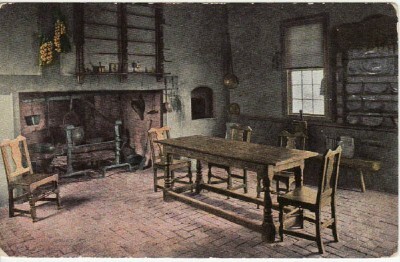 There were six split-bottomed chairs, one long bench, and a few three legged stools…half a dozen pewter plates, as many knives and forks, tin cups, and pewter spoons for ordinary use, and the same number of delf plates, cups, and saucers for special occasions; also, one dish large enough to hold a piece of pork, bear meat, or venison, with the turneps, hommony, or stewed pumpkin. All this table ware was kept in the corner cupboard, and so adjusted as to show off to the best advantage, and indicated that the family were well fixed for comfortable living. When the weather was too cold to leave the door or window open, sufficient light to answer the purpose came down the broad chimney, and saved the expense of glass lights; and as for andirons, two large stones served as a good substitute…It is true the cooking was usually done in the presence of the family, but was soon dispatched, when the Dutch oven and skillet were nicely cleaned and stowed under the cupboard, and the long handled frying-pan hung upon a nail or peg on one side of the door, while the water pail was situated on the other, and the neat water gourd hanging by it. For mantle ornaments they had the tin grater, used in grating off the new corn for mush before it was hard enough to grind, and the corn-splitter, being a piece of deer’s horn, very useful in parting large ears of Indian corn for the cattle. Morris, Bishop, The Ladies Repository. Western Style of Living. Livermore, Mary. The Story of My Life. 1899. Howe, Julia Ward. Reminiscences 1819-1899. 1899. Esarey, Logan. A History of Indiana. 1915. Take a brief moment to think about every dish you serve which has been browned under the broiler to make it more visually appealing or to cook quickly under direct intense heat. Ask yourself would the mac and cheese with the nice buttery bread crumb topping look as good when you send it to table if you didn’t brown it first? Next ask yourself how you might go about browning the top of any dish if your broiler suddenly went on the fritz. The odd looking tool pictured above was used for browning the surfaces of such dishes. It was made of cast iron with a round, flat, but relatively thick plate attached to a long handle which made it possible to grasp the cooler end of the handle without getting so close to the heat of an open hearth fire. The plate could rest on the two short legs while pushed into the hot coals so that the cook did not have to hold up its ample weight during the heating process. Less often the plates were square rather than round. This writer has found no illustration of a salamander with a square heating plate. – Norwak, Mary. Kitchen Antiques. 1975. Praeger Publishers. Salamanders without legs somewhat resemble a metal bread or oven peel except that they are much smaller and shorter than a peel. During use, the red-hot round plate could rest on the legs and the dish could be passed underneath it, or if, say the dish was taller than the plate while resting on the legs, the salamander could be turned over and held by the cook who passed it over and around the surface of the dish. Salamanders were not as common in Colonial era kitchens as many other tools and finding an original today is a rare treat. A good blacksmith can make one that will rival a rare and expensive original. Receipts which instructed the cook to brown the surface of a dish were being published by the early to mid 18th century, but for several decades yet the writers would not automatically assume the cook possessed a salamander. Some receipts told the reader to heat a shovel, meaning a hearth-side fire shovel, till it became red hot and toast the dish with it by passing it over and around. Other books called for a salamander to be used in the same manner, while still others told the cook to use whichever was available. 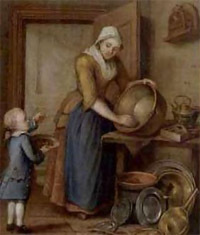 Kitchen Scene, Patissier, Tour a Pâte, Bassines, Mortier &c, Robert Benard, ca. 1760. For Diderot’s Encyclopédie ou Dictionnaire Raisonne des Sciences et des Arts. The definition of a fire shovel from the 1770’s was, “an instrument to throw coals on a fire with”, nothing was said about the type of metal the shovel was made from. – A New Complete English Dictionary. 1770. Edinburgh. Diligent research revealed, however, that fire shovels were made of iron, and therefore conducted heat as well for the job of browning as the salamander, accomplishing two tasks for the price of one tool. – Boswell, John. The Scot’s Magazine. Vol. 30. March 1768. “They roast or parch it in a fire shovel, or such like iron instrument…”. – de Thévenot, Jean. The Travels of Monsieur De Thevenot Into the Levant. 1686. London. In 1723, John Nott’s cookery book instructed the use of a red hot shovel in a dozen receipts, but made no mention of a salamander. – Nott, John. The Cooks and Confectioners Dictionary. 1723. London. The following receipt is somewhat unique in that it offers the cook the option of cooking on a bread peel, also heated until red hot, and to brown the surface of the eggs with a red hot fire shovel. It does not mention a salamander. To broil Eggs. After heating an Oven Peel red hot, blow off the Dust, break the Eggs on it, and put them into a hot Oven, or brown them on the Top with a red hot Fire-shovel: When they are done, put them into a Dish with some Gravy, Elder-Vinegar, and grated Nutmeg; or Vinegar, Pepper, Juice of Orange, and grated Nutmeg. – The Lady’s Companion. 1743. London. In a book published in 1737, a dish of oysters was to be browned with either a salamander or a shovel. Scallop-Shells of Oysters. Set and beard them, season them lightly with Pepper, Salt and minced Parsley: Butter the scallop-shells very well; then, when your Fish or Oysters are neatly laid in, pour their Liquor, thickened with grated Bread, over them, let them grill half an Hour and brown them with a red hot Salamander, or Fire-shovel: You may garnish a Dish of Fish with them, or serve them by themselves for the second Course. – The Whole Duty of a Woman. 1737. London. Cookery books continued to instruct in the use of a red-hot salamander or shovel for browning a dish into the early 20th century. For example, Frederick Vine’s 1907 book contained nine receipts which used a red hot salamander, but there was no mention of using a shovel. – Vine, Frederick. Practical Pastry: A Handbook for Pastrybakers, Cooks, and Confectioners. 1907. London. Next time a historic receipt speaks of a salamander you will have a visual to associate with the tool and an understanding of how it was used. The potato took an interesting route in getting on our dinner tables from South America. Personally, I don’t believe it is possible to pin point the first known consumption of a potato in Europe or in the U.S. There are numerous accounts referring to the first use, but they are simply the first use the writer was aware of. There may have been people who ate them much earlier and just didn’t have the ability or means to document it. I don’t believe it is possible to label any one place outside their native habitat as the absolute first place someone ate a potato either. I do, however, think others with far more time to research the matter than I agree that the first known written word on potatoes was by the Spaniards ca. 1532. Some unknown author peering at his paper through dim flickering candlelight once wrote that potatoes were first carried to Ireland by Sir Walter Raleigh (some say Sir Francis Drake), and one then another copied his account to the point it eventually became gospel. Among such accounts is one from Sir Robert Southwell, President of the Royal Society, who declared the potato was introduced in Ireland by his grandfather on 3 December, 1693 after he had obtained it from Sir Walter Raleigh. I have no doubt his grandfather may have gotten potatoes from Sir Walter Raleigh because why would someone need to lie about such a thing? His believing it to have been the first did not make it so, it was merely the first account he was aware of, or it was family legend which oftentimes can be quite tainted in its accuracy. His information is flawed because several translators have placed the potato in the hands of the Spaniards who are said to have been growing it by around 1570 and from where it spread through Europe and Ireland. That’s a difference of 123 years. We do know that the potato had so long been the major crop grown in Ireland that when blight wiped out the crops severe famine followed, the worst of which was in the 1840’s. 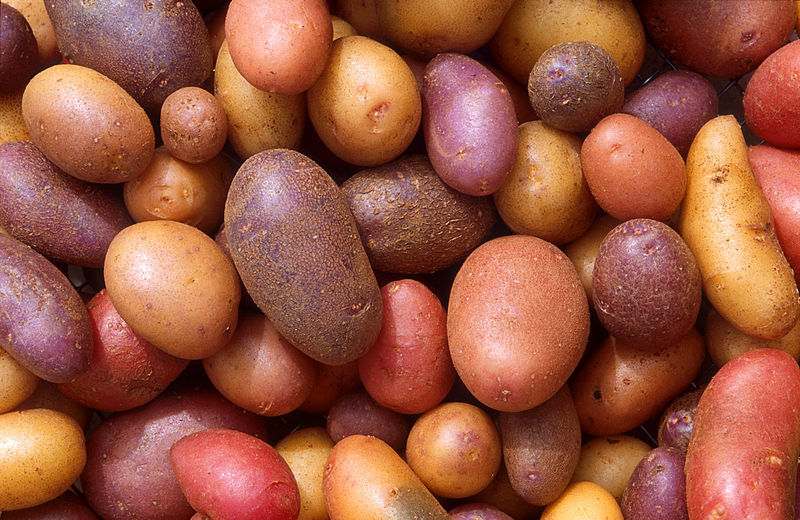 Some early references regarding potato culture give us some idea of its commonality in Europe and from there it made its way into the U.S. with the European immigrants. 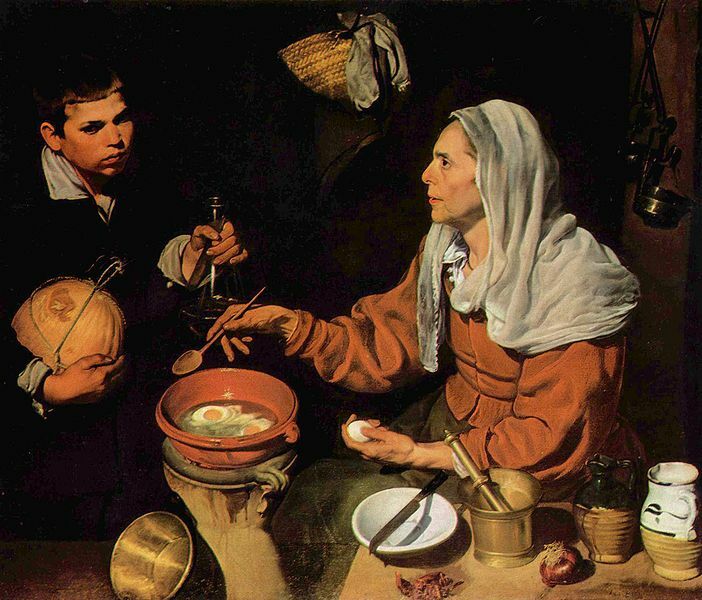 In London in 1586, A. Smythe-Palmer wrote of a guest being, “shocked and outraged beyond endurance because a dependent at the dinner-table of his host suggested that he, the Beau, might help him to a potato with his own fork.” – Smythe-Palmer, Abram. The Ideal of a Gentleman: or, A Mirror for Gentlefolks. 1586. London. John Gerard was growing potatoes in his garden which he wrote about in his Herball in 1597. He called it the potato from Virginia; however, if it was a true potato it is unlikely it came from the North American colonies that early. If it actually came from Virginia, which could just mean from the colonies in the New World, it was probably one of dozens of wild native tubers similar to a potato but not a true potato. A book printed for Richard Wodnothe in Leadenhall Street, London, in 1655 said the potato crop affected a large number of farmers in the country and kept many employed thus we know its culture had grown into a fairly large scale operation by then. Abstracts on Money, Prices, and Agriculture in the United Kingdom. Vol. 1. 1655. London. 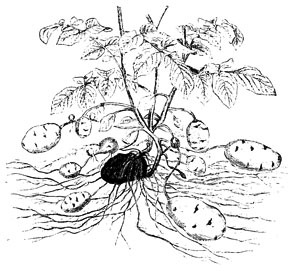 Potatoes supposedly matured two months sooner than in England when grown in salt-peter enriched soil in Jamaica although several factors influenced the growth of any plant, not the least of which was temperature and rainfall. Philosophical Transactions: Giving Some Accompt of the Present Undertakings, Studies and Labours of the Ingenious in Many Considerable Parts of the World. Printed for John Martyn, Printer for the Royal Society. 1669. William Dampier seems to have distinguished a difference in potatoes and yams as he listed both in 1699. – Dampier, William. A New Voyage Around the World. London. A Portuguese writer wrote of a root like the potato, or batata in 1609 which he thought poisonous. There are stories of people cooking the plant and throwing out the root in the earliest days of potato consumption which probably did cause sickness making some believe the potato was poisonous. Being declared a member of the nightshade family didn’t help its popularity. – Hacklvyt, Richard. Virginia Richly Valued: by the Description of the Main Land of Florida. 1609. London. 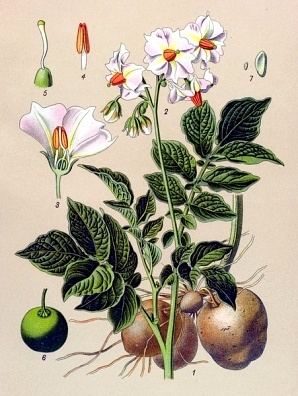 John Smith wrote in 1613 of a ship that went to Virginia and, “thence home”, and brought the first potato roots, “which flourished exceedingly for a time, till by negligence they were almost lost (all but two cast away roots) that so wonderfully have increased, they are a main release to all the Inhabitants”. This is evidence potatoes were being grown in the American colonies in the earliest part of the 1600’s. – Smith, John. The Generall Historie of Virginia, New-England, and the Summer Isles. 1632. London. John Worlidge wrote in 1700 that potatoes were much used as bread in Ireland and America. “They grow in any good mellow ground and are increased by planting them as the scorzonera”. – Worlidge, John. Systema Horti-culturae. 1700. London. Bosman wrote of potatoes which, “runs across the ground”. They were oval shaped, perfectly white within, and were boiled or roasted and eaten for bread. He claimed they tasted something like boiled chestnuts. Although he says they were white, the plants running across the ground is probably a sweet potato. – Bosman, Willem. A New and Accurate Description of the Coast of Guinea Divided into the Gold, the Slave, and the Ivory Coasts. 1705. London. In 1704, Churchill called it the patattes of the Portuguese and said the Dutch, “boiled them with fish and flesh, excelling in taste and sweetness much like parsnips or artichokes, and they were also eaten raw with salt, oil, and vinegar like a Salad, but are not of so easie a digestion then. The best way is to roast them in the ashes which makes them taste like chestnuts”. – Churchill. A Collection of Voyages and Travels. 1704. London. The diet of the inhabitants of the western islands of Scotland at the beginning of the 18th century consisted primarily of little flesh, only those of distinction having it every day, and boiled more than roasted. “Their ordinary diet is butter, cheese, milk, potatoes, colworts, brochan, i.e. oatmeal and water boil’d.” That remark shows that potatoes were a large part of the common family’s diet by that time and probably for some time prior. – Martin, Martin. A Description of the Western Islands of Scotland. 1716. London. Richard Bradley included potatoes in his list of vegetables in 1718. New Improvements in Planting and Gardening: Both Philosophical and Practical. London. He called them, “potatoes of Spain”, batatas or pappas in Dictionarium Botanicum. 1728. London. John Nott listed potatoes as an ingredient in eleven receipts in his The Cook’s and Confectioner’s Dictionary. They were baked into pies or made into stews or fricasees. – Nott, John. 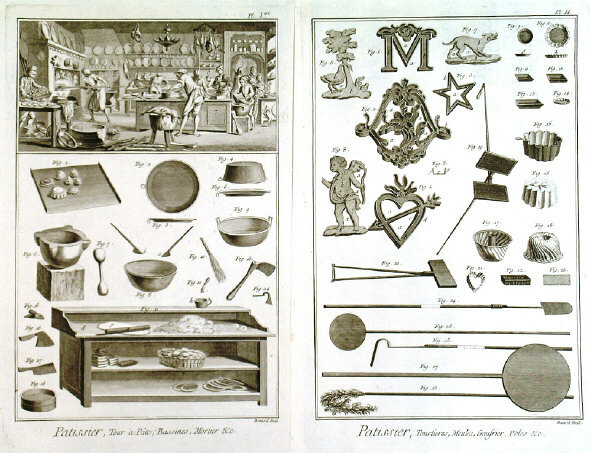 The Cook’s and Confectioner’s Dictionary. 1723. London. Numerous internet sites place potatoes in U.S. gardens in 1621 when gifted to the governor of Virginia, although this writer did not locate a primary source verifying that information. I have neither the time nor the inclination at this time of digging deep enough to prove or debunk that statement. John Smith’s account predates this by 8 years anyway. We know they were eaten at all times of day by 1711 as evidenced by an old diary entry dated Feb. 5, 1711, saying the writer had breakfasted on ham and potatoes. – The Montreal Gazette. Nov. 3, 1939. They were listed among the garden plants grown by William Byrd in the 1730’s. William Byrd’s Natural History of Virginia, translation by Richard Croom Beatty and William J. Mulloy from a German edition printed in 1737. (Dietz Press. 1940. Richmond. An account from 1797 extolled the virtues of potatoes and outlined the ways they were commonly prepared. The English and probably American colonists served them roasted or boiled and eaten with butter, sometimes with the skin on and sometimes with it peeled away, and chopped into small pieces and served with butter or fried bacon. They were used in making hash, roasted in pan drippings, and made into lobscouse. “No vegetable is, or ever was, applied to such a variety of uses in the north of England as the potato; it is a constant standing dish, at every meal, breakfast excepted, at the tables of the rich, as well as the poor…” – The Analytical Review, or History of Literature, Domestic and Foreign. 1797. London. The Scots were regularly enjoying their champit [mashed] potatoes by the early eighteenth century, if not before as evidenced by a study done by the Highland and Agricultural Society. Transactions of the Highland and Agricultural Society of Scotland. 1737. Edinburgh. T. Williams published a receipt called To Dress Potatoes in 1797. The cook was to put them in a saucepan with very little water and simmer them until the skin started to crack. The water was drained off before serving them. His stuffed chine of pork was served with applesauce and potatoes, and he offered a receipt for a potato pudding. For his lamb pie and veal pie he specified the use of Spanish potatoes indicating he may have used both varieties. – Williams, T. The Accomplished Housekeeper and Universal Cook. 1797. London. Cholesterol wasn’t an issue when the early receipts were published for fried potatoes. Large amounts of butter bulked up the calorie intake for hard working farm-class families. Pare and slice potatoes half an inch thick; then wipe them dry, flour, and put them into boiling hot lard or dripping, and fry them of a light brown colour. Then drain them dry, sprinkle a little salt over, and serve them up directly with melted butter in a sauce boat. – Mollard, John. The Art of Cookery Made Easy and Refined. 1802. London. To make John Mollard’s Creamed Potatoes the cook was to peel and quarter the potatoes and boil them until half done. They were then drained and salt, cream, and butter were added. The potatoes simmered slowly until done without breaking them apart. 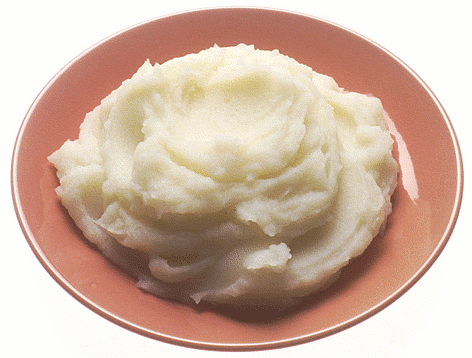 Mashed potatoes contained the same ingredients but were mashed up before serving them. He offered the option of placing the mashed potatoes into scallop dishes and browning them with a salamander before taking them to table. George Johnson’s receipt for Fried Potatoes basically produced home fries, and by partially precooking them he greatly reduced the amount of cook time needed to fry them golden brown. A receipt that talks of putting food into boiling fat is to some degree discussing deep frying and not pan frying. Fried Potatoes are also very nice; the best plan is to boil more than you require for your meal the day before, and when half done, take a few out of the saucepan, and the next day they will be firm enough to cut into thin slices, which are to be put into a frying pan in which there is some boiling dripping; fry them till they are nicely browned, and before putting them on the dish sprinkle some pepper and salt over them. – Johnson, George. The Cottage Gardener. 1801. London. In closing, this article is meant to be a general over-view of early potato use and history. It is not meant to be the end-all, covered-everything history which would obviously require much more space than I have. Perhaps this has inspired you to whip up a potato dish or two. July always brings to mind Independence Day, and an article published in 1895 notes what the day was like in days gone by. The book I am currently working on will be of interest to anyone who finds this a good read – it will contain a general history of known vegetables, wild plant foods, and how they were made into salads of all sorts, cooked and non-cooked. I think the reader will be surprised to learn that by successive planting and by planting multiple varieties our ancestors had a wide array of fresh fruits and vegetables throughout most of the year. 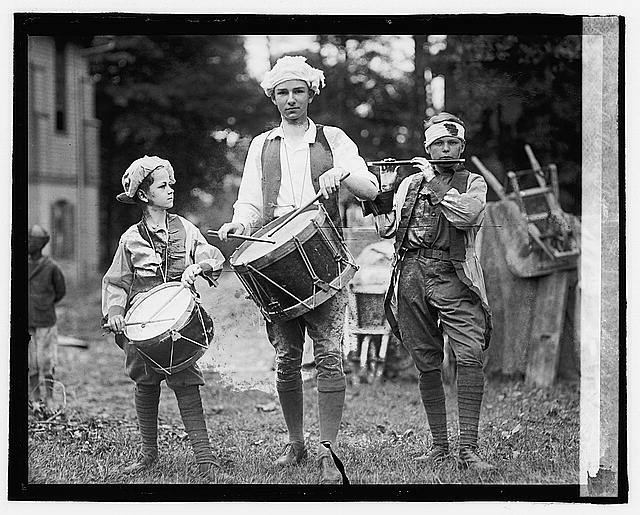 Some articles of food are specially associated with a Fourth of July dinner, and when canned goods were a thing unknown, and dwellers in country villages knew nothing of forcing vegetables, it was customary to have the new potatoes and peas ready, if possible for that day. The various acts passed by the British Parliament for the purpose of raising a revenue from the American subjects, led to the giving up of many articles of comfort, and the adopting of home-made substitutes. Prominent among these obnoxious measures were the Molasses Act and the Sugar Act. Of the former Adams said, ‘I confess that molasses was an essential ingredient in American Independence.’ Yet we seldom think of it in comparison with tea. We have an account of another dinner-party of Revolutionary time, of a little later date than the one just referred to. When General Marion, called for his bravery and strategy the ‘Swamp Fox’ was encamped at Snow’s Island, he received a young British officer sent to conduct some negotiation concerning exchange or release of prisoners. The royalist was brought to Marion blindfolded, and the interview took place out-of-doors. Business having been conducted, Marion invited the stranger to dine with him, an invitation gratefully accepted. The dinner consisted of roasted potatoes, served on pieces of bark. The guest, forgetful of etiquette, expressed surprise and inquired whether this was common fare. Marion answered that it was, and he was happy to have a little more than usual, as he had company. The story goes that the young Briton gave up his commission soon after, saying that men of such indomitable spirit could not be conquered, and ought not to be. The Dec. 1907 issue of Good Housekeeping contained receipts for Southern-style vegetables which may be of interest to those whose gardens are doing especially well. My family has always been fond of the cashew, fried green tomatoes, and peas and rice. The writer said the receipts had been plantation favorites for many generations. BAKED CASHAW. Cashaw is a vegetable resembling the northern winter squash; it matures in the summer, and may be stored away for winter use, as are pumpkins. It is very delicate and finely flavored when properly cooked. Chop off the long neck, which may be sliced and fried, like potatoes; split open the hollow round part of the cashew, and scrape out the seeds, wipe, and bake in a slow oven till tender; scrape the flesh out of the rinds, mash and mix with a tablespoon of butter, a little salt, a cup of sugar, an egg and a sprinkle of nutmeg; put this mixture back into the empty rinds and bake until brown on top. Serve as a vegetable, and eat with gravy or hot butter. Pare and grate two large sweet potatoes, mix with a cup of molasses, with a pinch of soda dissolved in it, a little salt, two tablespoons of melted bacon grease, or butter, a tablespoon of flour, and a small quantity of ground spice. Pour the mixture into a hot greased pan and bake very slowly till well done and quite brown. Eat this hot or cold, with gravy and meat or with milk and sugar, just as you prefer. Wash a cup of dried field-peas, commonly called “cowpeas”, or, if green, two cups will be necessary. If dried peas be used pour into boiling water, but if green, into cold, and add two or three slices of bacon and boil in plenty of water till nearly tender; then add a cup of washed rice, a pod or two of red pepper, and a little salt. Stew slowly till the peas and rice are very tender, shaking the pot to prevent scorching. This needs careful cooking for a long time, but is a very excellent stew. Pare and split open a large eggplant, boil until tender, remove all the seeds possible, and mix with two tablespoons of flour, an egg, salt and pepper, and a small onion, finely chopped; drop into spoonfuls of boiling lard, and fry brown. 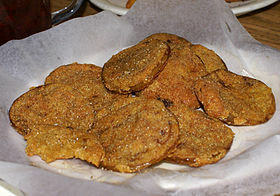 Cut into thin slices large green tomatoes, sprinkle with salt and dip into cornmeal, fry slowly in a little butter till well browned, keep the frying pan covered while they are cooking so they will be perfectly tender. These are very delicately flavored and much easier to fry than ripe tomatoes. They make an excellent breakfast dish. Chop into slices a dozen pods of young okra, fry until brown in a little butter, and add a cup of stewed tomatoes; season with salt, pepper, and a little sugar, and simmer for a few minutes. Pour over slices of hot toast. Have a few slices of good bacon simmering in a saucepan, wash and cut the ends off a dozen pods of tender okra, add to the bacon and let it cook slowly till very tender; drain, remove bacon and serve with rice. For an updated presentation for the fried green tomatoes use them to make a BLT, serve them layered with sliced fresh mozzerella, chipotle mayo, or drizzle with ranch or blue cheese dressing. What was in Grandma’s Pantry? I thought it would be fun to have a look at the ads in Good Housekeeping just after the turn of the century and see what specialty items could have found their way onto my grandmother’s pantry shelves. The following are from GH, Dec. 1907. Postum coffee substitute, no jangled nerves from caffeine when you drank Postum. Old Grist Mill wheat “coffee” came in a nice box illustrated with the image of a grist mill. Perhaps that was to draw your mind away from the fact you were purchasing parched wheat for your morning beverage instead of actual coffee. Borden’s Eagle Brand Condensed Milk, est. 1857, “proven the best for nursery and household”. Jello offered 7 flavors of instantly made gelatin – a real timesaver. Heinz Mincemeat, “A Winter Luxury”, beef, suet, flawless apples, raisins, currants, candied citron, orange, and lemon peel, and, “the purest spices brought from every corner of the globe”, were combined to produce “real” mincemeat without the work of making one’s own. Fish direct – salt mackeral, dried salt cod, smoked halibut, and canned seafood direct from Gloucester delivered right to your doorstep. Log Cabin maple syrup – syrup in a tin that looked like a log cabin. Royal Peanut Butter, “for the school lunch”, packed in air tight, paraffin sealed, glass jars. In case Grandma wasn’t the best cook and housekeeper, she could obtain a free copy of Hints for Housewives from the makers of Old Dutch Cleanser. There were Whitman’s chocolates for those who wanted store-bought candy and Royal Dutch cocoa. One could purchase horseradish for 10c a bottle, Lea & Perrins worcestershire, Junket for turning milk into ice cream, Purina whole-wheat flour, Gorton’s pickled fish, prepared baby food from the Health Food Co., Campbell’s Tomato Soup, Liebeg’s Extract of Beef, French’s pure spices, Fairy Soap – a white bar that floated, Quaker Oats, Van Camp’s Pork and Beans, and malted milk. The housewife was just getting used to the idea of purchasing many of these items when her mother and grandmother had had no choice but to make their own. 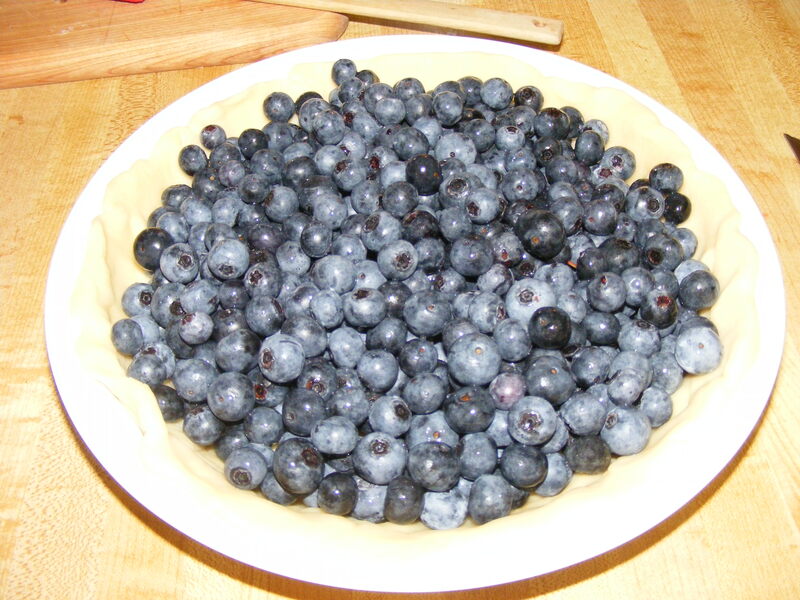 Not so much historic, but really good comfort food, blueberry pie, blueberry foole – you can’t go wrong this time of year. My favorite recipe is so simple you can whip one up in just a few minutes. It’ll take you longer to juice the lemon than to mix the pie. 2 pints berries – you can use frozen and thawed berries if you like, 7 Tablespoons cornstarch, 3 Tablespoons water, 2 Tablespoons freshly squeezed lemon juice, 2/3 cups sugar, 1 unbaked pie crust. Optional: 1/2 tsp. cinnamon and 1/4 tsp. allspice. Put berries in a collander and wrinse, let drain well. Combine the sugar, cornstarch, and spices. Add the lemon juice and water and stir well. 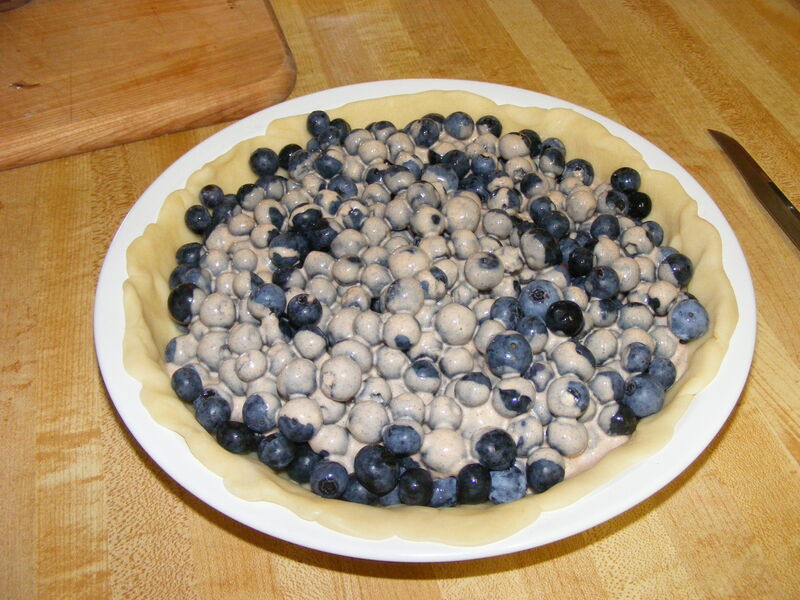 Put the berries into the crust and drizzle the sugar mixture evenly over them. You can top with a crust or with the following crumb mixture. Bake at 375 deg. for 45 min. to 1 hour – until berries are bubbly and top crust or crumb topping is browned. Crumb topping: 1/4 cup sugar, 1/2 c. flour, 1/4 cup butter. 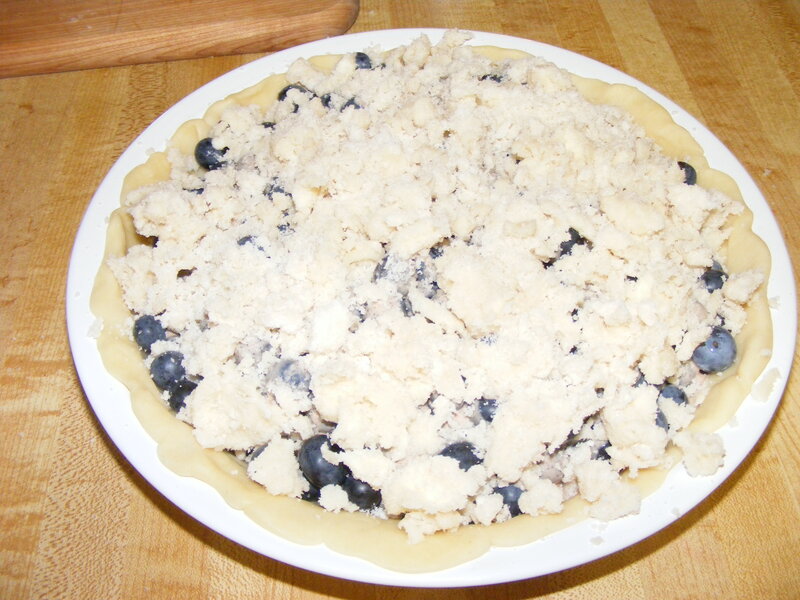 Use a pastry blender and combine well – mixture will be lumpy. Sprinkle over the filling and bake as above. Custard receipts have remained in print since at least the 15th century, seemingly changed little over the years other than most have now dispensed with the raisins or dates sometimes called for in the earlier receipts. The ancient Romans discovered the thickening properties of eggs and made both savory and sweet egg-based dishes. In A Propre New Booke of Cokery, 1545, the author instructed the coffyn [crust] be hardened in the oven, and then the custard mixed with a quart of cream and five or six egg yolks. Sugar and raisins or sliced dates were put into the coffyn with butter or marrow to sweeten it. The coffyns were not always meant to be eaten, but served as a vessel to hold the pudding inside. During that period of time crustades, or custards, named for the paste in which they were contained, continued to be made in both sweet and savory versions, the latter sometimes contained herbs and cheese, most commonly parsley, and artichokes. 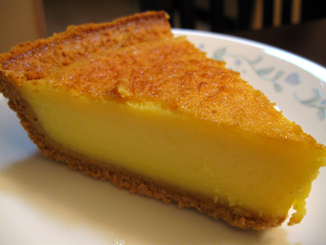 A quiche is essentially a savory custard. By the 15th century the egg and cream mixture was commonly served as a pudding, put into a coffyn, later called a crust or paste, or baked in china cups as instructed by Hannah Glasse in 1747. Such dishes were thickened with eggs until the early 19th century at which time powders were made available that would thicken the cream for custards. Perhaps the most well known of the custards today is crème brulee – a smooth custard sprinkled with sugar which is then quickly carmelized on top. Before the days of handy kitchen torches for browning the sugar a tool called a salamander was heated very hot and held over the sugar to melt it. 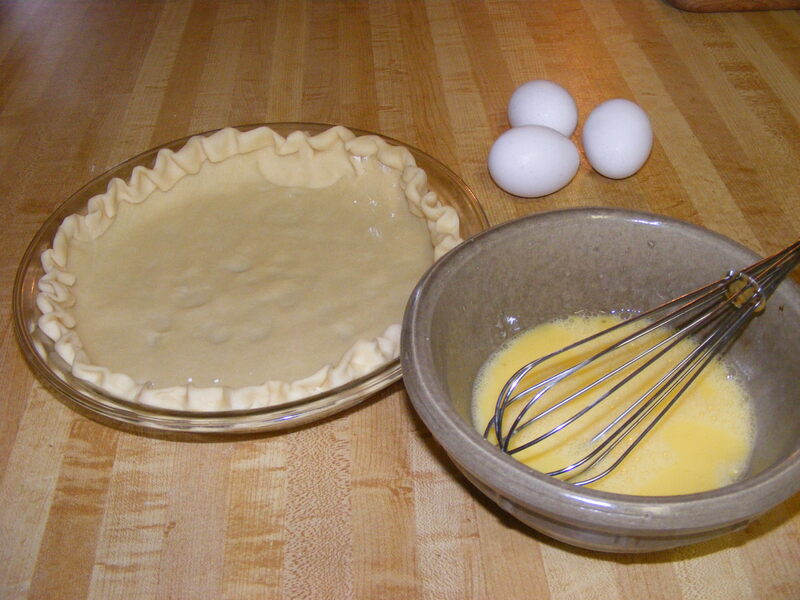 Lemon, orange, cinnamon, nutmeg, or mace were commonly used to flavor the eggs and cream mixture. The most common flavoring today is nutmeg followed by lemon. A 1717 cookery book contained five recipes – for a basic custard, almond custard, rice custard, lemon custard, and orange custard. Numerous other books contained multiple receipts indicating custards were quite popular. – Williams, T. The Accomplished Housekeeper and Universal Cook. 1717. London. 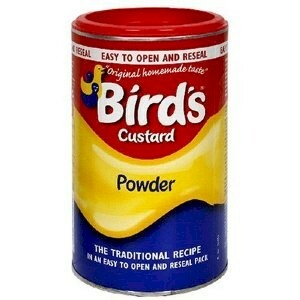 The first mention this writer found of powder used for a thickener in making custard was N.M.K. Lee’s The Cook’s Own Book, 1840. [Note this source is a correction, the original posting wrongly credited this to Wm. Kitchiner 1830. A comment from a reader prompted me to clarify the previous statement and in so doing I realized I had attached the incorrect source. Powdered loaf sugar was the norm in the 18th century and does not refer to a thickening agent, however, the last note in the receipt does. Any 18th or early 19th century cook had to pound, or powder, if you will, the loaf sugar before using it in a receipt, but the powder to which I was referring to as a thickening agent was at the end of the recipe. “Ground rice, potato flour, panada, and all puddings made from powders are, or may be prepared in the same way” – these agents are thickeners and not sweeteners. Boil a pint of milk, and a quarter of a pint of good cream; thicken with flour and water made perfectly smooth, till it is stiff enough to bear an egg on it; break the yelks of five eggs; sweeten with powdered loaf sugar; grate in a little nutmeg and the peel of a lemon: add half a glass of good brandy; then whip the whites of the five eggs till quite stiff, and mix gently all together: line a pie-dish with good puff paste, and bake half an hour. N.B. Ground rice, potato flour, panada, and all puddings made from powders, are, or may be, prepared in the same way. – Lee, N.M.K. The Cook’s Own Book. 1840. Boston. In 1837, Alfred Bird developed a powder made primarily from cornflour which could be used in place of eggs to thicken custards. His wife was apparently allergic to eggs but enjoyed custard so he set about producing a thickening agent that could be used in place of the eggs. It is still made from cornflour (cornstarch) with sweetener and a coloring agent and sold in Europe under the name Bird’s Custard Powder. By the 1880’s recipes are found for egg custards, perhaps to distinguish them from those made with the powdered thickeners which were becoming more common. 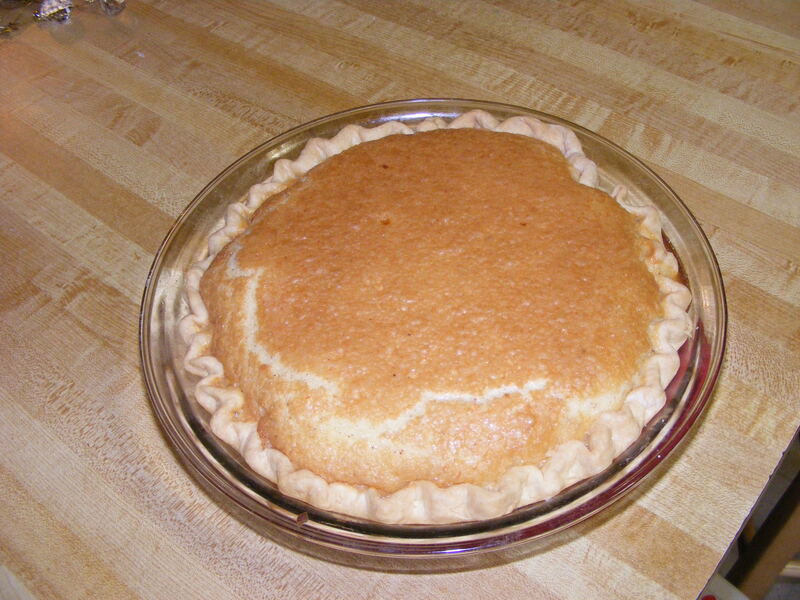 The pies are still called egg custards in the South. Beat the 1 cup sugar with the eggs until creamy. Beat in milk, melted butter, vanilla, and nutmeg. Heat the oven to 300 degrees. 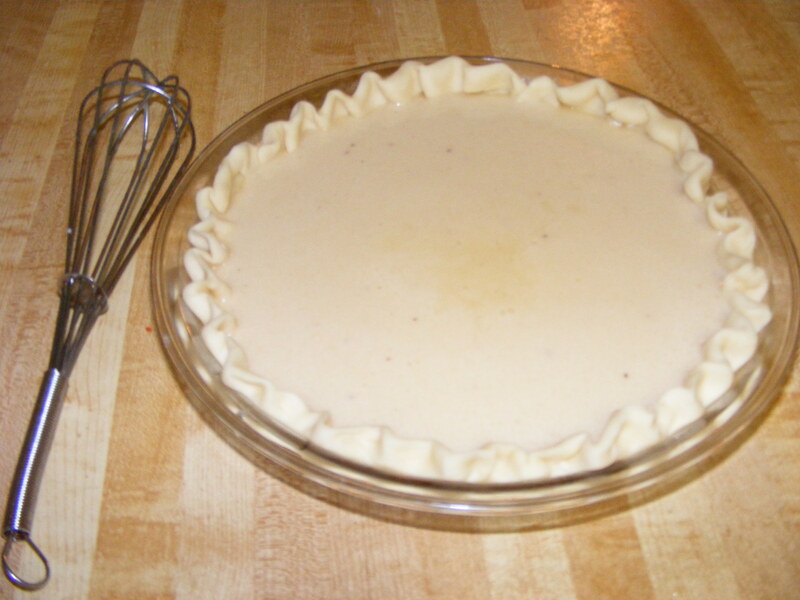 Pour custard into pie shell and bake about 40 minutes – until firm. MacIver, Susanna. Cookery and Pastry. 1789. London. Collingwood, Francis. The Universal Cook: and City and Country Housekeeper. 1792. London. Harrison, Sarah. The House-Keeper’s Pocket-Book, and Compleat Family Cook. 1760. London. Markham, Gervase. A Way to Get Wealth. 1668. London. Williams, T. The Accomplished Housekeeper and Universal Cook. 1717. London. Glasse, Hannah. The Art of Cookery Made Plain and Easy. 1747. London. 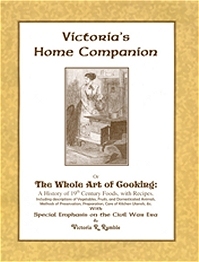 For more information and recipes see Victoria’s Home Companion, available from this site. It has been a while since I posted anything on the books I have written and this morning is as good a time as any for a refresher. [See below for covers, etc.] I offer discounts for blog readers, and excellent discounts for shops and merchants for resale. Having a conference? Feel free to email and ask about a discount for your attendees. 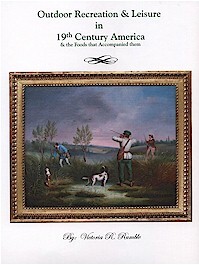 The Companion is a general overview of prepared dishes and cooking techniques through the 19th century – when people knew how to prepare a tasty meal instead of opening cans and boxes or hitting the drive-through. You’ll find measurements and conversions to aid you in your culinary adventures and enough original recipes to give you some great incentive. This book has been appreciated by those who want to live a more self-reliant lifestyle as foodies of a more scholarly nature. Both books are available directly from the author for wholesale or retail. Your inquiries are welcome. 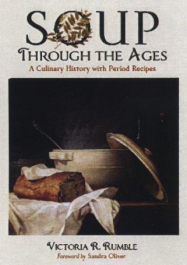 Soup Through the Ages: A Culinary History with Period Recipes is available from McFarland Publishing Co. They will welcome your order – either wholesale or retail. The book begins in the Biblical era and takes you through the Victory Gardens of the second World War. There are dozens of recipes and the history of the world’s most beloved dish, and it is chock-full of photographs and illustrations. It covers techniques such as how to build and maintain a fire for outdoor cooking yet any food in the book can be prepared in your kitchen as well as outdoors. Food historian, Andrew F. Smith, editor in chief of The Oxford Companion to American Food and Drink called it, “a massive amount of research…A solid contribution to culinary history!” Order today and see for yourself just how easy it is to prepare from-scratch soup. You’ll find delicious food can be as fast as take-out and much better for you, not to mention less expensive. Enjoy!